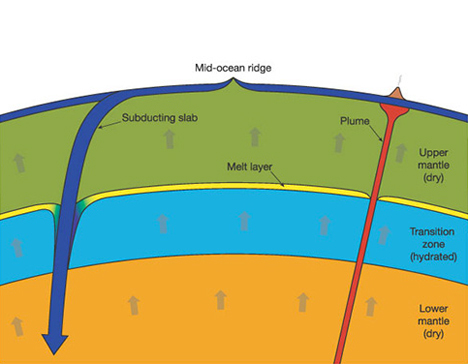 Scientists have suspected for decades that there is a water-containing “transition zone” between the Earth’s upper mantle and lower mantle, but its existence is impossible to confirm due to its extreme depth. Spanning from 250 to 400 miles beneath the surface of the planet, the area is unreachable so no samples have ever been obtained to confirm its composition. The odd-looking little rock above, however, is providing some very compelling information. It is thought to have shot up from the transition zone at 40 MPH after a volcanic eruption. The rock is a diamond that contains the minerals ringwoodite and walstromite, stones which only form under extremely high pressure. The unassuming little rock – far uglier and rougher than those used in jewelry – was found in a Brazilian riverbed in 2008. 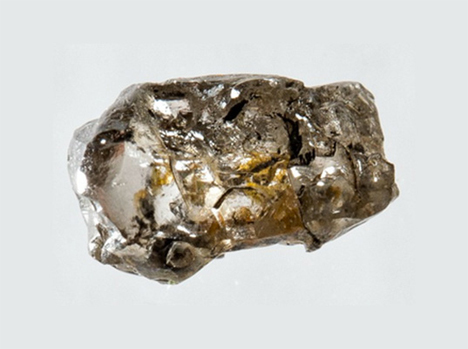 A team of geologists were running tests on the diamond to work out its age when they happened upon the mineral inclusions which were too small to see with the naked eye. Geophysicists had known for some time that the moisture-rich minerals must exist in the Earth’s mantle – and in large amounts – though no one had ever seen them. The minerals are composed of 1.5 to 2.5 percent water, an unusually high amount that indicates the transition zone may contain more water than all of the oceans on the surface. The discovery is so important because it tells us a great deal about the composition of the planet. It not only confirms the presence of water in the transition zone, but could help to explain surface anomalies that occur due to that water. Weak spots beneath the continental plates, volcanic eruptions, and “uplift” spots may all have something to do with the transition zone water. 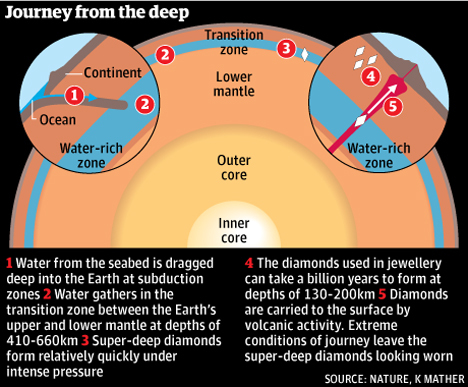 Don’t expect to see any “Journey to the Center of the Earth” type subterranean ocean journeys in the future, though – the water in that part of the planet is all trapped in the minerals there. See more in Earth & Nature or under Science. July, 2014.